This work has now been purchased by the School and can be seen during office hours; please ask at reception for directions (main staircase, second floor). This text discusses the work and will be updated from time to time. Using the format of local archaeological strata this work presents a simultaneous chronology from pre-Roman times to 1900 of the evidence of human activity and the perceived prevalence of infectious diseases. Within a framework that connects time to object, the links between specific types of material and specific diseases raises the question of the viability of pathogens over periods of time. The size of the potentially infected area (2.4 x 4.3m / 8 x 14 ft 3 in) refers to the notion of miasma, the space of polluted air within which the power and point of hygiene becomes questionable. The work also raises the link between fear of disease and susceptibility to disease, the role of disease in history, and the acts of transference of pathogens. To us, even with the benefit of hindsight, the simple business of washing hands before dealing with food, or after dealing with dirt, which would clearly improve an individuals chances of combating disease seems such an obvious idea that we can easily find ourselves thinking that our forebears must have been stupid in this respect. This teleological perspective on the past does not take account of the framework of thought pertaining to disease, miasma, bad air, etc. Simply put, if you are moving within an area of infection in which the physicality of the atmosphere is infected, why bother with hygiene? The plague/smallpox/bloody flux will get you if it chooses to. Apparently fatalistic, this view is compatible with a view of an ordered universe, where natural disasters are brought about by an upsetting of balance by human agency, a notion which persists in the phrase what have I done to deserve this? Both positions indicate an awareness of a relationship between the natural environment and the group or individual in terms of power or the lack of it: the individual or group is able to influence the activity of the natural environment by good or bad behaviour, a position of power, but is unable to act against disease propagated by miasma, and consequently sees little point in trying to. And yet, the early incidence of germ-warfare, informed or not, indicates a degree of manipulation of the environment in terms of the management, if not control, of disease. Looking at the history of thought surrounding the idea of contagion has led me to wonder what exactly were peoples ideas as regards the mechanics of contagion. If we look at the history of deliberate acts of infection the catapulting of infected corpses into besieged cities, for example in the case of the Crusader armies besieging Nicaea (now Iznik in Turkey) in 1098, who catapulted diseased human heads in to the city. The Dorling-Kindersley book Epidemic (Brian Ward, publ. Dorling-Kindersley, London, 2000), states (p60) that the motive for this was to spread disease, though fear may equally have been the prime motive. The other example quoted in the same caption, of Mongol soldiers attacking the port of Kaffa in the 1300s using plague-infested bodies, again gives no contemporary documentation of motive. However, observation of cause and effect would presumably have led to the choice of diseased bodies as a suitable material for flinging at an enemy, rather than for example sackloads of excrement, or rotting food. On the other hand these materials being rather less sensational would have made less interesting pictures for monks to compose in the annals of history; it is necessary to remain aware that these conjectures are based on the availability of information and are highly subjective. However, there seems to have been some awareness of the actuality, if not the mechanics of the transference of the means of infection, at least as early as 1546. Saul Jarcho in Contagion, Krieger, Florida, 2000, quotes the statute of that date regulating the activities of barbers (also operating as surgeons) "forasmuch as such persons using the mystery or faculty of surgery, oftentimes meddle and take into their cures and houses such sick and diseased persons as been infected with the pestilence, great pox, and such other contagious infirmities" In other words there was an officially recognised awareness that it happened at the same time as Fracastorius 1546 publication De Contagione containing his exposition of the three pathways by which it happened. How did these two paths of thinking, infection by particle versus infection by miasma, remain compatible for so long? As regards the formal composition of the work, I have not specified dates. There are three strata which may be used as indicators, two showing particularly strong outbreaks of plague, and one of an epidemic of English Sweat between them. English Sweat was the name given to an epidemic that swept through England in the late 15th century, and which was particularly active in the armies of the Wars of the Roses. popular consciousness associates the plague locally with the dates of 1348 and 1665. There are a few coins in the strata, which may be dated by their designs though their dates are barely legible. 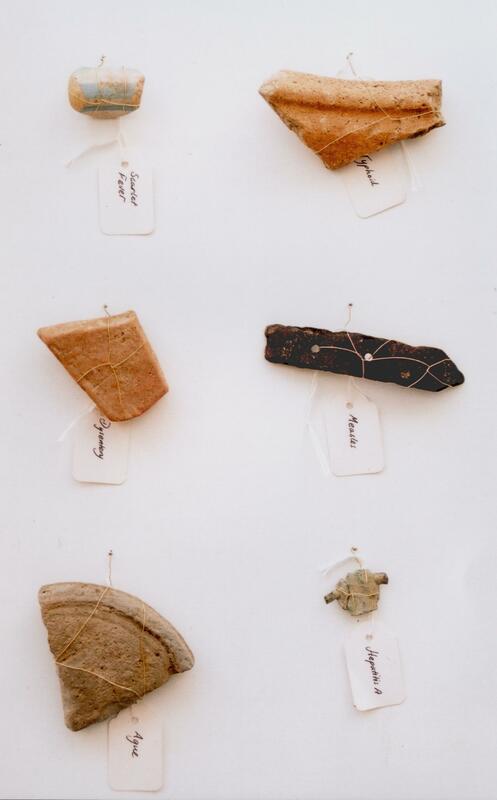 Thus the periods can be calculated by looking at the objects (the arrival of blue & white glazed porcelain fragments, the increasing regularity of metalwork, the disappearance of green-glazed pottery), and the objects can be determined by the strata they occur in. Chronology by means of ceramic sherds is a familiar practice to watchers of t.v. 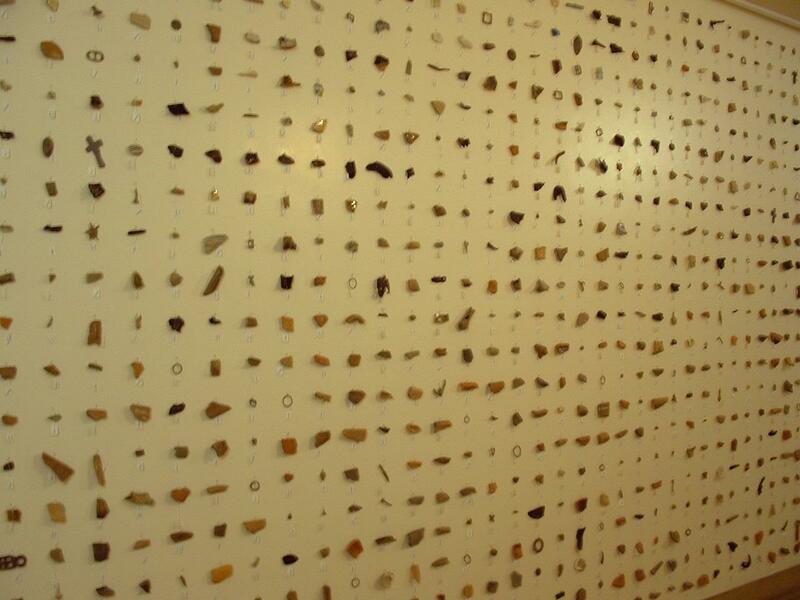 archaeology, but there are survivals (there is evidence of interest in and use of the past from prehistoric times), and some objects have been inserted into strata "before their time", reflecting the history of archaeological fallibility. Early on in the composition of the work it became apparent to me that as well as dealing with the changing levels of activity of the diseases I was going to have to deal with the evolution of language. The names of diseases change, become more specific, or research divides one disease into many. It would be enticing to postulate the incidence of for example Hepatitis A in the early mediaeval period, but I have relied on the research I have been able to do, and information from medical authorities within and outside the LSHTM, to indicate the relative prevalence of diseases in periods for which documentation is hard to come by. I have tried to combine the recorded use of official names of diseases at any given time with the known incidence of a disease at a time when there was no name for it. Thus, where a disease undoubtedly existed but was not known by its current name, or a by a name that was superseded, I have used the current name, e.g. Tuberculosis in the period pre 1860. Where a name has been isolated etymologically at a certain point (e.g. Chickenpox, in 1727) I have used that name from that point. Previously chickenpox would have been thought of as one of a number of diseases, measles, smallpox, etc. Typhoid fever was prior to 1800 thought to be a version of Typhus. From about this period I have separated them, but in the period immediately prior to this I have included Typhoid Fever within Typhus. Prior to that I have separated them into distinct diseases.